Separatists violated the ceasefire 16 times. 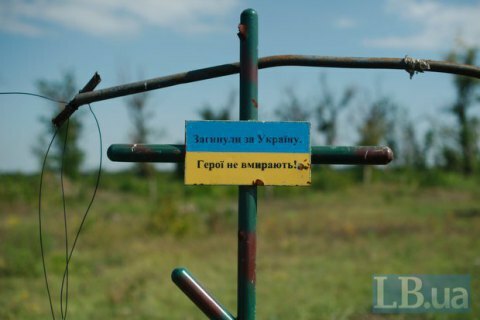 One Ukrainian serviceman was killed and two were wounded in Donbas on 28 October, the antiterrorist operation (ATO) HQ reported on Facebook the following morning. "The past 24 hours in the ATO area were marked by an increase in shooting attacks against Ukrainian positions by the Russian occupying groups in the Donetsk sector […] Illegal armed groups have violated the ceasefire 16 times over the past day," ATO spokesman Anatoliy Stelmakh said. In the evening, pro-Russian militants launched two attacks for several hours each against the ATO strongpoints in the Avdiyivka industrial zone. One Ukrainian serviceman was killed as a result of the attack at around 9 p.m. The militants also targeted residential houses in Avdiyivka's suburbs by the end of the day. In the evening, they fired with heavy machine guns on Opytne, Pisky and Zaytseve. In the Mariupol sector, the militants fired around 20 bombs of 82-mm calibre against the village of Vodyane and targeted the ATO positions near Starohnativka and Shyrokyne after 6 p.m.
Two Ukrainian servicemen were wounded on 27 October. Trade in pardons. How can Jagland's attempt to drag Moscow back to PACE end up?